Income statements show the revenue, expenses, and profits for a specific time period. There are many different names for an income statement, including a profit and loss statement, P&L, statement of earnings, or statement of operations. Sometimes the word consolidated is thrown in front of those phrases, but it’s still just an income statement. The bottom line of the income statement is net profit, also known as net income or net earnings. 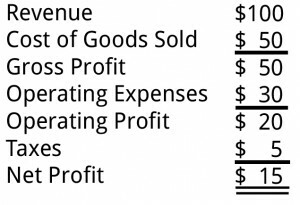 In this sample income statement, revenue minus cost of goods sold equals gross profit. From there operating expenses are taken out showing operating profit. Any other non-operating items are then taken out such as taxes to leave you with net profit. Amounts shown in thousands. No matter whose income statement you’re looking at, there will be three main categories. One is sales, which may be called revenue (it’s the same thing). Sales or revenue is always at the top, costs and expenses are in the middle, and profit is at the bottom. You can usually tell what’s important to a company by looking at the biggest numbers relative to sales. For example, the sales line is usually followed by “cost of goods sold,” or COGS. If that line is a large fraction of sales, you can bet that management in that company watches COGS very closely.